This post could well be titled as the story of my Kitchenaid. Kitchenaid is not easily available in India. When Ro travelled to southeast Asia, 2 1/2 years ago, he offered to buy it for me and even lugged it around 2 international airports with a bad back. This man surely knows how to win my lifelong devotion towards him! Then it so happened that my Kitchenaid lay neatly packed and stacked inside a cabinet for 2 1/2 years. Yes! You heard it right! 2 1/2 years! I had craved for a Kitchenaid, I had one and life circumstances (read travel, shift, pregnancy, childbirth, etc) forced me to keep this trapped in the confines of a cupboard. Whatever the reasons, I still feel they are not justified and I could have some how opened it and started to use it. I had a tiny kitchen then which was already overflowing with a number of gadgets and I just didnt have the adequate place for this prized possession. Maybe the fear of not putting it to the ultimate use was topmost in my mind and that was what also prevented me from using it. And now the happy news. I inaugurated my kitchenaid in my new spacious kitchen and it now sits pretty on the counter amidst other appliances. I made some bread rolls the other day and my Kitchenaid did all the kneading and taught me that bread making was a breeze. That said these rolls are perfectly made with your hands without the help of any appliance. I made 2 batches one with dried basil and oregano and one with dried basil, oregano and thyme. I liked the one without the thyme, but Ro liked both. If you like thyme then feel free to use it. What I love about these rolls are that they are baked together in a shallow round tin and you can break off a roll, dunk it in butter or virgin olive oil, dip it into hot soup or simply eat it as it is. However you choose to eat them, I promise they wont disappoint you and once you make these they will most likely be a regular feature on your table! 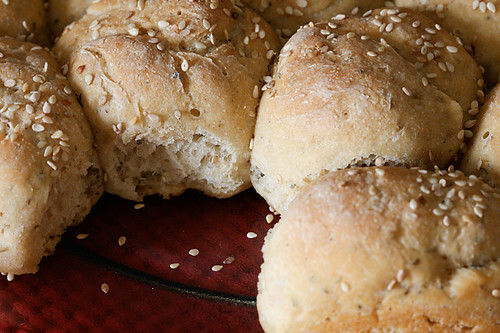 These rolls go to yeastspotting and to Bread Baking Day (BBD) hosted by tangerine's kitchen. This recipe is adapted from the book Cooking with Kurma. I substituted the plain flour with part wholemeal flour and used dried herbs instead of fresh. If you have access to fresh herbs then double the quantity and chop very finely. Lightly oil a 10” round baking dish. In a small bowl, mix the yeast, a little of the warm water and sugar and leave undisturbed until frothy. Mix in the oil and herbs after the yeast turns frothy. In a stand mixer with the paddle attachment, mix together the flour, herbs and salt. Put in the yeast mixture and the remaining warm water and mix on low speed until the dough comes together. Alternately, if you want to do this by hand then mix the flour and salt in a large bowl. Make a well in the centre and pour in the yeast mixture. Add most of the water, reserving a little and make a soft but non sticky dough. After the dough comes together in the stand mixer, change to the dough hook and knead on low speed for 4 to 5 minutes or until the dough becomes smooth and silky. You can knead the dough by hand for 5 to 8 minutes on a kitchen platform. Allow the dough to rest in a an oiled bowl for about an hour or until approximately double in size. Knock down the dough and divide into 18 equal sized pieces. Shape them into round balls on a floured surface with the help of your hands and arrange them in the 10” round baking dish, keeping in mind that the balls are going to double in size. Allow the dough to rise again for 30 minutes. Brush with water using a pastry brush, sprinkle with sesame seeds and bake in a pre heated oven at 220 degree celsius/430 degree F for about 30 to 35 minutes or until golden brown and hollow sounding when tapped. Makes 18 rolls or buns. Awesome recipe Anu..looks so wonderful!..I was eagerly seeing if the machine is available here..nice reading about it..
this means, i need to get a kitchenaid…. right? A terrific way to inaugurate your Kitchen Aid. These rolls look awesome and fluffy. I'm a bread addict and these look incredibly delicious. Flavorful and tasty. Looks so perfect and professional! 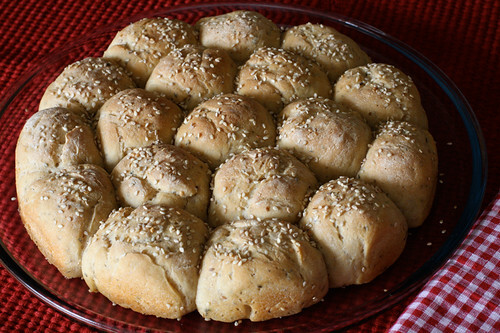 Perfect rolls…that too with wheat am sure a healthy way! You had kitchen aid for 2.5 yrs and you didnt use it? OMG I am dying to get my hands on one 😀 Bread rolls look fantastic! wonderful and so perfect! nice one! Oh..KitchenAid..I too am craving it! Anyways, I am always after things made with whole wheat rather than all purpose flour – looks like this one is gonna be a keeper! Srivalli: Kitchenaid is available in India but at thrice more the price. Simi Its better you buy it from the Asian or European market. If you buy it from the US for use in India, you would have to use it with a transformer which I think is not a very good idea. Parita: Yes! And do I feel guilty about it? Bags and bags of it! I have been promised a kitchen aid for my next b'day and hope it works out…Love the rolls you made…thank you for sending them in for the event. They look lovely, I'll definitely have to make these soon. I'm horrible at kneading and never find the space but I do have a kitchen aid! I wanted to add that ground up dried rosemary in liberal amounts can be quite good in dinner rolls, maybe try that one too. 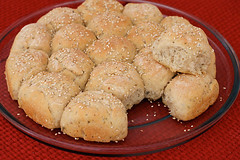 Shannon: Will try adding ground up dried rosemary the next time I make these rolls. Thanks. Just wanted to tell u that I tried these out and they were really delicious though! only thing I had problem dividing them equally and ended up with a sort of lopsided bread! Npot half as goodlooking as urs..but i was delicious!!! thanks a bunch! Wow! Great looking rolls Anu! So fluffy! With everything available here I still don't make full use of the opportunity! :(. 'Guilty' as they say it I guess. But I am gonna try this one, with or without kitchen aid. Sheba: Divide the dough into 18 equal parts and roll them into round balls, just the way you would chapati dough. You should be able to get neat pieces the next time. My favorite combination of herbs – this recipe is on my to-do list now! I hope I can make this awesome rolls also without an kitchenaid. 😉 Thank you for your participation in BBD. Thanks for the eggless receipes. This is the first baking i tried out in my oven. I had few problems. Hope you can help me out. 2) After baking, the rolls were very hard in the outer layer. It was a bit soft inside, but nor porous enough. Where do you think i went wrong. Jey: If the dough did not rise well it could be because of the yeast. The yeast may not be of good quality. If you followed all the steps but did not get the correct texture then I cannot see any reason other than yeast. Try using another brand. Amazing recipes! I however have faced some problems, the taste is great but the texture of some of the dishes i tried from your recipes hasn't turned out like yours. I was wondering if its something to do with the oven or any feature of it. I have a Samsung oven (http://tinyurl.com/samsung-mw) and i use the convection feature and bake it for the time mentioned. can that be an issue? Pujya: Thanks. My recipes are not formulated for use in a microwave oven. I never use one and get the best results in baking by using my built in oven or my OTG. Please refer my FAQ! These turned out amazingly perfect. Couldn't have got through without the perfect and precise guidelines. Please put up recipes of wholewheat bread and multigrain bread. Have tried other recipes but have turned out a damp squib. Look forward!! I so agree with you on the Kitchenaid story. I had always wanted one and dreamed of all the delicacies I would be churning out with the Kitchenaid. I have now owned this beauty for about 2 weeks now, and I have still not pulled it out of its box. I am going through all the excuses/ fears of small kitchen, no counter space, too many appliances…etc etc. But I will definitely pull it out this weekend, before hubby decides to return it. The first thing I will try is your rolls or focaccia bread. First of all, thank you for this awesome recipe. I've been looking for something like this for long… and this was just perfect. Just a few things I want to tell you with my experience. Please give me your feedback on it. 1. This didn't make 18 equal portions for me. Somewhere after 6 rolls, the dough division was uneven and as a result I had only around 10 rolls. Probably it's just me! Also, if you can give me some tips on preserving yeast packet that's been opened. Should I store it in the fridge? How long will it be active? How long can I have it? This is just so I don't use too old an yeast the next time I bake something with full enthusiasm! Oh yeah, I skipped the sesame seeds on top and we loved it the way it was at home! So is the softness something to do with the brushing of water on top, which I didn't do? Meghana: You need to divide the dough equally into 18 balls. I have made this several times and got 18 of them. But, I don't see a problem if you shape them to whatever number you want. prefer or get out of this dough. 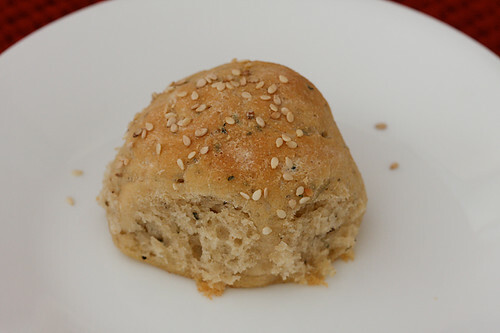 Even if you don't want the sesame seeds, it is important to brush the dough with, water or milk. I even brush them with butter when they are hot out of the oven. Looks like the heating inside your oven is uneven. Unequal distribution of heat inside the oven can lead to the problems that you have mentioned. Once you open a pack of instant yeast, put it in an air tight container and place it in the refrigerator. This stays fresh for upto 2 years. OMG… Anu i tried this and it came out awesome .it was sooooooooooo good ,but i did not add the herbs .next time i will try it with the herbs.i never made roll like this before,the kids love it .my 5 year old son had 2 of them just after they finish one after the other.the girls take it to school for lunch the next day .tks anu…..
simone: So happy your children liked it. And thanks for reporting your success! I don't have a kitchenaid but I still made them and they came out perfect. All 18 of them turned out good even in my old bajaj OTG. I used food processor for kneading. Only lil prob i faced was crust came out to be a little harder than it should. Is it possible to make one big loaf with this recipe? Have you tried it? Prachi: Brush the top with ample milk and bake for a little lesser time than stated in the recipe. Looks like your oven needs a little less baking time. I had few questions regarding storing these buns once made..how long is their shelf life? How would you store them till then…in the refrigerator or at room temperature?How would you reheat them…in the microwave or on a hot pan?Thank you. I just baked these amazing rolls and they have come out so well 🙂 Can't thank you enough. Shuchi: Thanks for the feedback! renu: Yes you can use fresh herbs instead of dried ones but you will have to double the quantity of the herbs. I have not tried making this as a loaf but I think it should work. I just posted another recipe for a loaf. You might want to take a look at that. Hey, I made these today.It turned out super good for an amateur bread baker like me.This givave me the much needed confidence to carry on yeast baking which I was postponing for the fear of failiures. Thank you so mjch for the detailed recipes. 1. Can I take only whole wheat and not mix any plain flour? 2. Can I substitute honey instead of sugar? Radhika: You can use only whole wheat flour but you will have a dense texture. I don't recommend baking with honey. According to Ayurveda when honey is heated it leads to toxins in the body. It looks like an amazing recipe! I had one question before I try it out – when you place the rolled out dough balls for the second proving, do you butter that baking dish or sprinkle flour or anything to ensure the rolls don't burn on the bottom or stick to the container when they are put in the oven? Ronak:You have to oil the pan. Its mentioned in the first line of the recipe. Good luck! I followed and baked the above recipe, today…. got great results too. Thank you for the well proportioned recipe. Have made it twice in two days… My family loves it.. and its only fitting that I give thanks to you!! DJ- am very happy to hear that! Happy baking! anju- No question is silly..don't worry. You need to put in the herbs with the salt into the flour. Sana- Whisk will not work as it adds volume and introduces air into the mixture making it light and airy. We need an attachment to mix and then knead to make bread dough.